Romance is this weeks Theme at the Penny Black Saturday Challenge. I decided to use this adorable dog from Penny Black's clear set "Critter Party". Image was colored with Prismacolor pencils and blended with baby oil. The image was cut out with my cutterbee scissors. I like to cut out very detailed so these sharp scissors are a MUST. The card is rather simple. Again, I felt like using a circle doily. I have fallen in love with doilies! The flowers were punched out with Su punches, I just added polka dots to the white flowers with a SU marker and attached with black brads. The sentiment is from SU's retired set "happy harmony" To finish the card off I added the lace border with ribbon, used my ticket corner punch for the sentiment and did some paper piercing along the edges. Thanks for stopping by today. I hope you are having a GREAT monday! Absolutely adorable! I just love that little dog...too cute! very very cute. great job. So cute!!! Love that saying from Happy Harmony. Your coloring is beautiful! Ellie, I love your card! The coloring on the pup is great! Oh wow,your card is fantastic. I love your blog! I will be back! 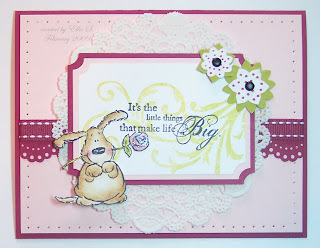 Very pretty card Ellie - love your layout and the doggie is so cute and beautifully coloured. Thanks for joining in the PBSC this week. Gorgeous card, Ellie! I just love that puppy dog image! This is gorgeous Ellie. I love everything about it! I'm diggin' this card! love the image and the colors you used...nice job!! Ohhhh how cute is this!!! I think I might need to break down and get critter party-I have 2 other PB acrylic sets. Such an adorable card...very cute! This card is adorable!! Great blog. I love your cards. Nice! The dog is so cute! Way too cute, Ellie! I love that doggie!! I adore this card - one of my favorites so far this week! Also - great taste in your blog layout! Ellie, this is fabby. Now tell me about this blending with baby oil, haven't discovered this yet?? Beautiful card! I love the layout and pretty colour scheme! Thanks for joining the PB challenge this week! I ahve this set also, the critters are just adorable! Love card! I am going to have to keep an eye open for paper doilies. They look fantastic on cards!